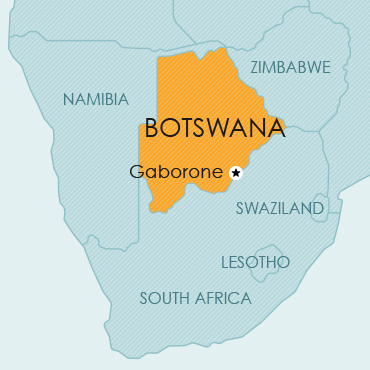 Botswana, formerly a British protectorate, became independent in 1966. It is a landlocked country in southern Africa, bordered by Zimbabwe to the north-east, South Africa to the south-east, and Namibia to the west. The so-called Caprivi Strip of Namibia extends along its northern border. Botswana is a member of the ARIPO (Banjul Protocol), the Madrid Protocol, the Paris Convention and the WTO/TRIPS. The Act expressly provides that, by the registration of a trade mark, the owner acquires the exclusive right to the mark, in the sense that only the owner can authorise other persons to use the mark. Provision is made for the registration of trade marks in respect of goods and services, and for collective marks. Trade mark protection may be obtained by way of a national filing in Botswana; or by way of a convention application claiming the priority of an earlier application in a convention country; or by way of an ARIPO registration. Botswana is a member of the Paris Convention, ARIPO (Harare Protocol), the PCT and the WTO/TRIPS. Botswana has implemented the Harare Protocol (which regulates patent and design filings in ARIPO) in its national laws, thereby giving valid patent protection to applicants seeking to obtain a patent via an ARIPO application. Accordingly, patent protection is currently available by way of a national filing or via an ARIPO application designating Botswana. Botswana is a member of the Patent Cooperation Treaty (PCT); however, at the present time the domestic laws have not been amended to provide for the PCT. Therefore, although it is possible to file PCT applications designating Botswana, it is not clear whether enforceable rights will at this time be obtained by patents granted on PCT national phase filings in Botswana. The Industrial Property Act, 2010, which has not yet been put into effect, provides for PCT applications. Botswana is a member of the Paris Convention, the ARIPO (Harare Protocol), the Hague Agreement and the WTO/TRIPS. Botswana is also a member of the Hague Agreement, so that design protection can theoretically be obtained by way of an international application under the Hague Agreement designating Botswana. However, Botswana has not yet introduced enabling domestic legislation to provide for such international applications, so that it is not certain whether enforceable rights can at this time be obtained by way of such an international application. The new Industrial Property Act, 2010, which has not yet been put into effect, provides for applications under the Hague Agreement. Botswana is a member of the Berne Convention, the WIPO Copyright Treaty, the WIPO Performances and Phonograms Treaty, and the WTO/TRIPS. Copyright protection applies to ‘works’, which are defined to include literary and artistic works which are original intellectual creations, as well as derivative works. illustrations, maps, plans, sketches and three-dimensional works relating to geography, topography, architecture or science. collections of works, collections of mere data (databases), whether in machine readable or other form, and collections of expressions of folklore, provided such collections are original by reason of selection, co-ordination or arrangement. It has not been possible to establish whether or not protection for plant breeders’ rights or other sui generis protection for plants is currently available in Botswana.